RON JOHNSTON The Marietta Times Williamstown’s Boston Caruthers (24) handles the ball during a high school boys soccer match against Parkersburg South last season. 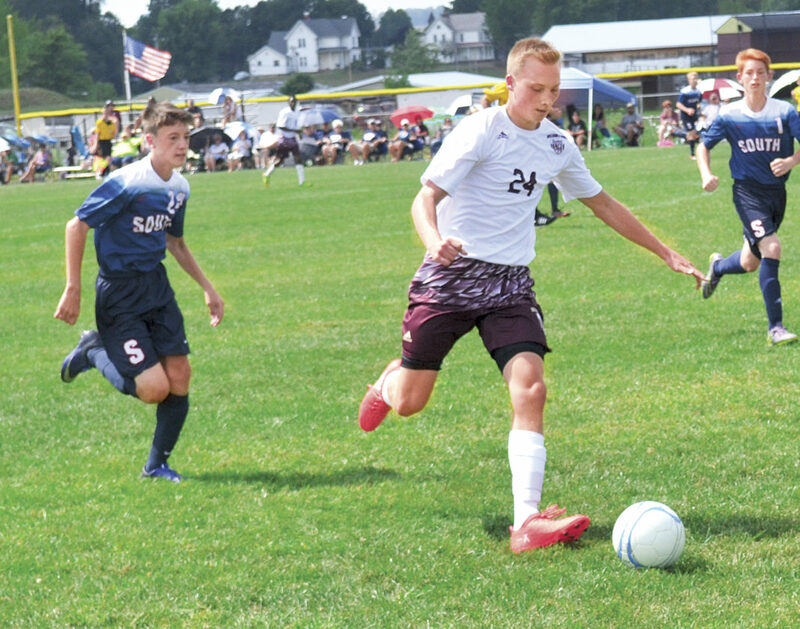 WILLIAMSTOWN — Williamstown High will be fielding a veteran boys’ soccer team this upcoming season. Those 13 juniors on the Yellowjacket roster last year are now seniors. Hill, who is succeeding Telma Poole at the helm, was the Yellowjacket girls’ soccer boss for a few years before taking a leave of absence from the sideline pitch last season. The Yellowjacket seniors are Josh Chambers, Damian Cunningham, Deshon Simon, Dylan Hall, Grant Bobbitt, Boston Caruthers, Trenton Lynch, Dylan Cosner, Joseph James, Cole Hodges, Mason Bosgraf, Bradey Fayad, and Landon Mahaney. Chambers, Bobbitt, and Bosgraf are the tri-captains. And, Caruthers is pulling double duty as a kicker on the Terry Smith-coached Williamstown football team. During preseason action, Williamstown played at Grafton and Phillip Barbour, and won both matches. “We looked good in those scrimmages,” Caruthers said. Added Hill, “We got on the bus and got used to traveling together, being together, and playing on turf. Both were two-hour bus rides away. Williamstown is scheduled to kick off its season on the road at South Harrison at 7 p.m. Tuesday (Aug. 21). The Yellowjacket starters are expected to be James as keeper; Chambers, Cunningham, Simon, Bobbitt as defenders; sophomore Garret Hill, sophomore Xavier Caruthers, freshman Mason Bosgraf, and Gavin Bosgraf as midfielders; and Boston Caruthers and Lynch as strikers.